→Top 10 Best Sunglasses for Women 2018: Check This Out! Top 10 Best Sunglasses for Women 2018: Check This Out! The glare of the sun is often times annoying most especially if you are outdoors. Plus the UV rays can also be harmful for our health. With that reason, are you looking for the best sunglasses that you can use to protect your eyes? Well, I suggest that you read this article in order to learn more about your options. Being outdoors is something that we can’t get out of our lives. When we go to work, school or even at the market we always encounter the rays of the sun during day time. Most of the time the glare interferes our vision and makes our daily chores difficult. 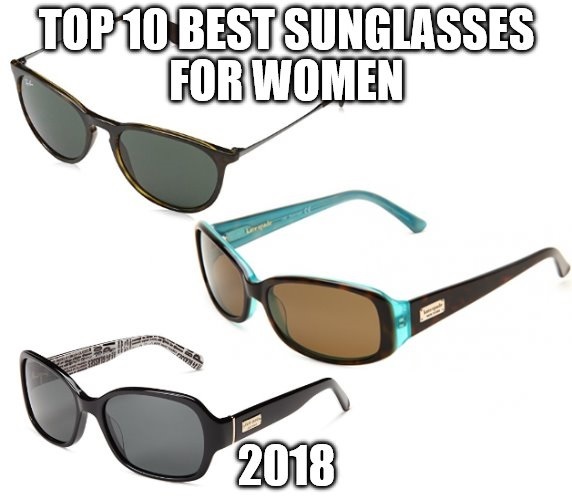 So I decided to make a list of the top 10 best sunglasses that women can use for this year 2018. This list is based on the effectiveness, durability, quality and aesthetic appearance of the eyewear. I suggest that you give some time and take a look at your options. Erika glasses by Ray-Ban have full circular rims. The frame is made of composite plastic frames, particularly nylon. The temples of these glasses are slightly extended outwards. They offer various color for the frames such as black, purple, brown tortoise, dark rubber sand, red velvet, brown, shiny silver, and rubber green. The lenses are made of polycarbonate material. Some of the lenses are mirrored, polarized, and offers 100% protection from ultraviolet (UV) rays. By the way, for authenticity, Ray-Ban glasses are etched with “RB” on the left lenses. Ray-Ban glasses come with a protective envelope-shaped case that goes with a variety of colors. This protective case is effective not only in mitigating stains and contamination from dust, dirt, oil, grease, and water, but also in preventing mechanical breakage from impact and/or pressure. Since the material of both the frame and the lenses is plastic, the glasses does not slip downwards at the nose. The polymer material is light that pressure on the nose and the ears are minimized. On a positive note, the frames made from nylon are strong and lightweight. All of the lenses are said to block 100% of UV rays. Hence, Erika glasses by Ray-Ban can protect the user’s eyes. The Paxton model of Kate Spade glasses employs a full rectangular rim that is made of acetate. 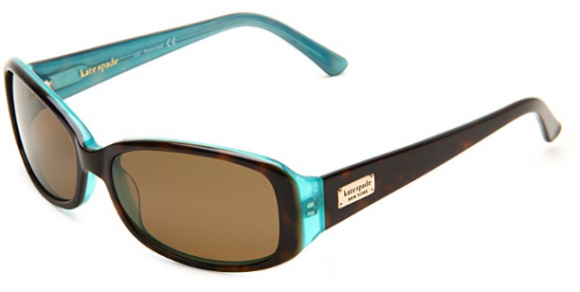 It comes in aqua tortoise, saffron tortoise, tortoise kiwi, tortoise stripe, and black stripe. Paxton glasses have the narrowest height of 33 mm (1.30 in) for all the lenses in the Kate Spade collection. All of the lenses are tinted in gradient with the darker hue starting at the top. The lenses also offer 100% protection from ultraviolet (UV) rays. The glasses come in original Kate Spade plastic hard case, colored in pink. Golden logo and brand name of Kate Spade is printed on top of the upper lid. It also comes with a cleaning cloth. The color of the frame is simple and classic at the outer sides of the frame. When worn, it is not so noticeable but the inner surface of the arms gives an additional accent to the frame. When it comes to the lenses, CR-39 stands at the mid for the quality of lens material. When it comes to optical quality, the best material is glass for it offers 100% transmission of light. The top of the lens having the darkest tint minimizes the light entering the eyes. On the other hand, the bottom part has less tint. With this set-up, the user could see clearly when walking down the road or read accurately while shielding the eyes from radiation. 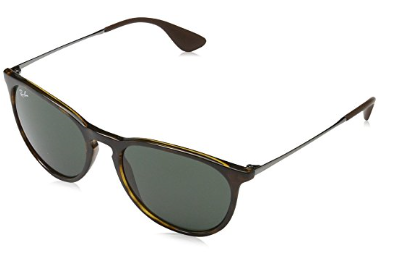 Chelsea sunglasses by Michael Kors is styled as an aviator eyewear. This style is characterized by slightly inverted triangular rims about two or three times larger than the size of the eyeball. The ends are covered by a polymer/plastic material that could be in black, white, grey, orange, green, or violet. The whole frame is made of metal that can be in copper, gold, silver, gunmetal, and rose gold. The lenses rounded edges that are slightly triangular in shape. They may be mirrored or not, polarized or not, and offers 100% protection versus ultraviolet (UV) rays. 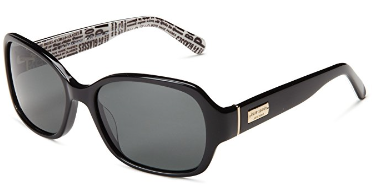 The glasses of Michael Kors includes a clam shell hard case with a magnetic closure. Apart from the glasses, a cleaning cloth is also included in the package. It effectively wipes away stains, dust, dirt, moisture, and other foreign substances from the lenses surface. Since it is made of metal, the glasses is slightly heavier than plastic framed glasses, as what it is supposed to be. Yet, the weight is bearable enough to not create dents on the nose of the user since the metal frame is flat and thin. On the other hand, the polarized lenses only allows a fraction of the light with a specific orientation to pass through it. Thus, glares or high-intensity light is reduced to something that is bearable for the eyes. In addition, the lenses have been graced by a 100% UV protection. Kate Spade glasses have frames that are made of plastic. It employs rectangular rims that have curved edges. The rims are thick enough to provide protection for the lenses. Meanwhile, the lenses of these Kate Spade glasses is made of composite material. All of Kate Spade glasses come with a colorful plastic hard case. The case features an orange base and a pink cover with the brand name and logo of Kate Spade printed on top. Looking at the design of the frames, anyone could tell that Kate Spade has put an effort in making the glasses look chic and modern. The style and colors are simple but the arms of each glasses make them look extraordinary. Since the glasses are lightweight, it doesn’t leave any pressure marks on the user’s nose and it still bears weight enough to maintain its position on the nose. On the other hand, the lenses have an additional function of polarization and UV protection. Polarization allows passage of light at a certain orientation. Thus, the intensity of light entering the eyes is reduced. This phenomenon cuts glare that distracts the user from their usual activities. These glasses can be worn outdoors especially on bright surroundings and sunny weather. It can be used mainly in activities like shopping, walking, driving, and sunbathing. The plastic frames are specifically made from O-Matter. All the nose pads are mere extensions of the rims except for metal matte, which has adjustable nose pads. They are made of Plutonite lenses that may either be non-polarized, and/or polarized with or without iridium. 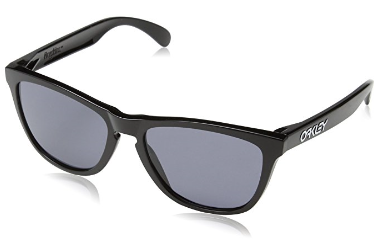 Oakley claims that these lenses blocks 100% of ultraviolet rays and harmful blue light up to 400 nm. The lenses are also anti-reflective. Aside from which, O-Matter™ is said to be stress-resistant material for frames. During impact, the material of the frame are able to absorb some of the force, providing protection for the eyes. It allows precise alignment of the lenses in accordance to the user’s eyes. 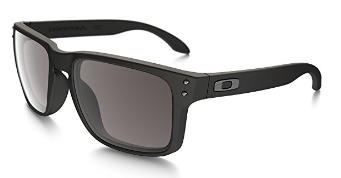 Just like other Oakley models, frogskin glasses also employ a wayfarer style wherein a larger portion of the rims is set at the lower part. The basic colors in matte available for Oakley frogskin glasses are aspen green, basin red (brown), black, and mesa orange. There are also neon colors, including gamma green and x-ray blue, as well. Aside from the complex designs and vibrant colors brought by the frame, it also brings out the quality bested by Oakley. The O-Matter is a material designed to exhibit critical degree of flexibility. This material aims to absorb impact and pressure allowing the whole assembly to be more long-lasting. Meanwhile, the lenses have many notable features. One of which is the material Plutonite. This material is optically pure and can withstand impact coming from objects with high mass and great velocity. Since the lens material is optically pure, it also exhibits high-definition optics (HDO). Negligible to zero distortion of images versus reality is viewed through Oakley lenses. The color adjusts the contrast of the images viewed through the lenses making them appear sharper in details. This tint blocks 99 – 100% of glare. Hence, the amount of light that enters one side is the same as the other side. The properties of the lenses ease the adjustment of the user’s eyes whenever he/she is wearing the glasses or not. The glasses come in original Oakley retail box, microfiber soft cleaning bag, case, and Oakley information leaflet. All of the accessories are in good quality. The only downside is the unification of the cleaning cloth and the bag. Talking about weight, it can be deduced that the overall mass of the glasses is light. In contrast, the lenses are tinted grey making the surroundings appear darker when the glasses are worn. Anyhow, the tint is just in gradient. The top part is darker and the user can see clearly at the bottom part. 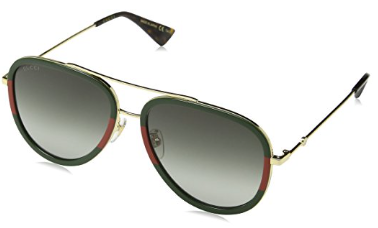 These Gucci glasses come with a velvet Gucci case that is fashionable in every sense. Aside from its beauty, it helps in protecting the glasses from stains and contamination as well as mechanical breakage. In addition, there is also a cleaning cloth and a pouch, for easy carriage. Jackie Ohh glasses by Ray-Ban have cat eye rims. The rims are almost rectangular with the upper, outer edges slightly swept upwards. The rims fully cover the perimeter of the lenses in apt thickness. The lenses come in various tints such as grey, green, and brown. These tints may be in gradient or not. Anyhow, all of the lenses of Jackie Ohh glasses are non-polarized and offers 100% protection against ultraviolet (UV) light. It adds a level of sophistication and maturity to their aura. Hence, soft-featured faces highly benefit from cat-eyes. Heart-shaped faces are also at an advantage for cat-eye and makes such faces appear to be in perfect proportions. Anyhow, it protects the eyes mostly from radiation coming above the level of the user’s head. 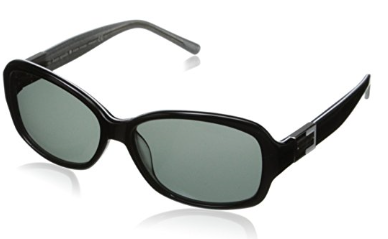 Gradient-tinted glasses are effective to use when walking under direct sunlight. Included in the package of Ray-Ban Jackie Ohh glasses is an envelope-styled case. In addition, a lint-free cleaning cloth that effectively removes contaminants from the glasses’ surface is present in the box. 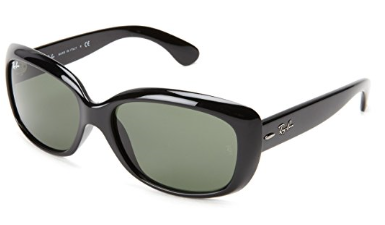 Sunglasses by Kate Spade follows the current trend or sets it. For Annika, the frames are made of acetate that features three colors: brown horn, tortoise, and navy. The frames being made of acetate allows it to have properties similar to plastic frames. Acetate frames are known for its lightweight property, flexibility, durability and ability to be made and dyed into complicated designs and patterns. Annika sunglasses are quite oversized. They have big rims that may overwhelm the user with small faces. The lenses are made of polycarbonate (PC), an example of a polymer material. The special feature of the lens is its 100% protection from ultraviolet (UV) rays. They could also be polarized or non-polarized. The lenses being made of PC makes them ten times more impact- or shatter-resistant than normal glass lenses. PC lenses are also lightweight so the probability of the glasses falling from the nose bridge would be reduced. It also has tint that improves the contrast of the surrounding involving the natural colors of blue and green. Hence, lenses with brown tint are best used for hiking, fishing, golfing, baseball, hunting, cycling, and water sports. Kate Spade includes a hard case in their glasses package. The cases may be rectangular or oval in shape that has a clasping mechanism. 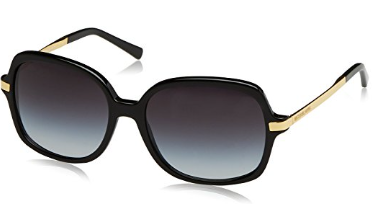 The design may look simple but the cut of these Michael Kors sunglasses gives a “geometric rework to a classical design.” The frames are not only composed of rectangular or oval rims but seems like a mixture of both. Additionally, the colors and design may seem simple but still looks elegant. The tiny detail coming from the metal part of the arms adds a boost of elegance to the overall look of the frame. Generally, the whole assembly exudes an ultra-chic feel. Most of the glasses is made of plastic, which are known to be lightweight. This weight does not bring much pressure to the key facial features like the nose and ears. Although the lenses are not polarized, the tint itself reduces the amount of light entering the eyes effectively. Yet, the tint comes in gradient. Still, there are lenses that are polarized. In polarized lenses, only a fraction of light with a specific orientation could pass through. These conditions effectively reduce glare. Hence, the appropriate activities for grey-tinted glasses are sunbathing and walking. This eyewear comes with a hard case and a cleaning cloth. These accessories are the basic necessities for glasses. The hard case provides protection while the cloth is needed for removing stains and dust, especially for the lenses. Having a protective eyewear is a health investment, so here are some helpful tips that you can follow to keep the glasses for a longer period of time. Always keep the glasses inside the hard case if not in use. This will ensure that it will be protected if it experience sudden fall. These are just some of the best sunglasses for women. By the way, I haven’t finished this list yet but I will add more eyewear in the coming days to complete it. Personally, I like the Ray-ban sunglasses and Oakley Frogskins. They have simple design and is quite durable. Plus the accessories included makes them more worthy. Nevertheless, all of these glasses provide valuable protection for your eyes against the harmful UV rays whenever you are outdoors. So it is just a matter of personal preference on which one you will choose. Those Ray Bans are real style. Strange how some companies can just hit it on the head and produce style and simplicity. Now the Kate Spades all have a nice wide side arm which does help to cut out glare from the side. Ray Ban do some wrap-arounds which I do recommend for outdoor activities but for pure grace and feminism, I go for the Ray Ban Erikas. Keep up the good reviews, it is always a pleasure to read about something as important as health and style. I am glad that I have helped you. Let me know if you have more questions about the sunglasses that you have chosen.